Form 4 filings are reports submitted to the SEC by investors who buy or sell shares in companies where they are deemed insiders. The SEC defines an insider as any officer, director or more than 10% shareholder of a publicly traded company. Insiders know undisclosed things about their companies — like upcoming financial results, pending contracts, or even buyout talks. Trading based on such “material, non-public” information constitutes illegal insider trading. As the watchdog of insider trading, the SEC requires any change in ownership by an insider to be reported on a Form 4. However, U.S. insider trading laws are notoriously unclear. It’s difficult to know if an insider is buying or selling based on proprietary information or if the insider is simply trading based on his or her business expertise. In any case, decades of academic research confirms that corporate insiders tend to profitably time trades. C-level executive purchases tend to be the most predictive, followed by directors. 10% holders trades are usually the least predictive. Large % increases in holdings, and selling reversals (an insider buy after a period of sales) are among other bullish events. To profit from “smart money” insiders, study Form 4 filings. For investors seeking to profit from the moves of the “smart money,” Form 4 filings reveal details about an insider transaction that helps determine the significance of the transaction. Form 4s must be filed within two business days of a change in either direct or “beneficial ownership.” For instance, even though a hedge fund manager personally doesn’t own stock XYZ, he must file a Form 4 if his fund owns 10%+ of XYZ and makes a trade in it. There is often a knee-jerk reaction by investors to an insider trading headline. But sometimes there’s more to the story, and the market over- or under-reacts. It’s imperative to read the Form 4 document to get the complete picture. Occasionally Form 4 information is inaccurate. For instance, transaction codes are sometimes wrong. Buys marked as sells, option conversions marked as buys, etc. Sometimes transaction dates are old. Likely because the insider omitted to file weeks or months ago. Often transactions that appear significant are actually non-events. For instance, a fund may trigger a Form 4 filing by moving positions from one sub-fund to another. But no new money is actually invested, so for a Form 4 analyst its a non-event. No one has added any skin to the game. 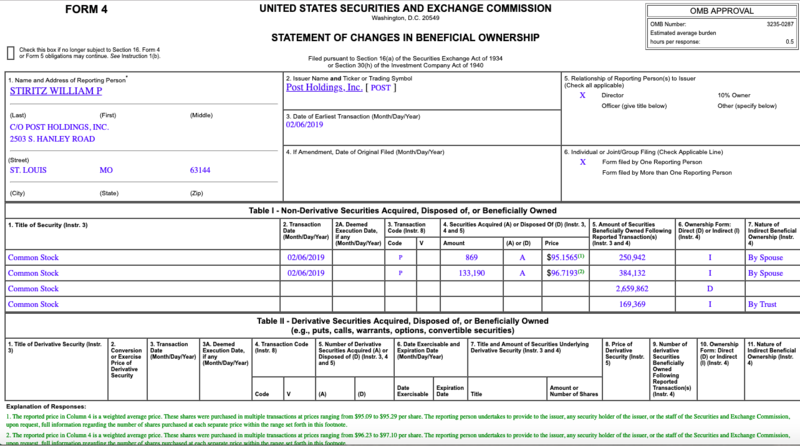 The SEC’s Edgar website or services like WhaleWisdom.com are good places to view Form 4 filings. Below is a Form 4 filed by Bill Stiritz of Post Holdings. I discussed this transaction previously. Items 1-4 are self explanatory. Item 5, Relationship of Reporting Person(s) to Issuer, describes the title of the insider. Note that an insider can have several titles–a chairperson, for instance, can also be a director and a 10% holder. Table I – Non-Derivative Securities Acquired, Disposed of, or Beneficially Owned describes details on the shares traded. 1. Title of Security is typically “Common Stock,” though be alert for convertible or other securities trades that triggered the Form 4 filing. 2. Transaction Date. As mentioned, as per SEC rules, this date should be at most two days before the filing date. Watch for trade dates that are many days earlier — this may reflect a previously omitted filing that is no longer timely/relevant. 4. Securities Acquired (A) or Disposed Of (D)— Includes the amount (number) of shares purchased, whether acquired or disposed and the price purchased. Individual lot prices are listed separately. 5. Amount of Securities Beneficially Owned Following Reported Transaction(s). This is the insiders total beneficial position after the reported transactions. 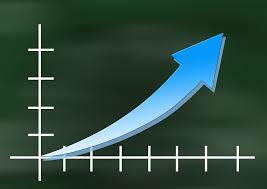 Find the stock’s shares outstanding to determine the insider’s % ownership. 6. Ownership Form: Direct (D) or Indirect (I). Note that in the above Form 4 filing, William Stiritz made the purchases directly for himself (D). Often you’ll see trades executed in a spouse’s account (I). 7. Nature of Indirect Beneficial Ownership. The insider explains any indirect relationship to the buyer of the securities. (e.g., puts, calls, warrants, options, convertible securities) — Derivative transactions are disclosed here. Typically not relevant if you’re looking to follow insiders into a position. Here’s a Form 4 filing by William Stiritz disclosing the exercising of options. The section of the Form 4 under Table II labeled “Explanation of Responses” or “Remarks” often contains valuable information for an investor analyzing insider filings. Often you’ll see this: “The reported price in Column 4 is a weighted average price. These shares were purchased in multiple transactions at prices ranging from ___ to ___.” This footnote likely applies to an open market transaction, as opposed to a trade that’s part of an offering or private purchase. Beneficial holders often shed light on their transactions in Explanation of Responses section. In this October 30, 2018 filing Elon Musk discloses he’s purchasing $20 million of additional TSLA in a direct transaction, in addition to the open market purchase reported. The bottom line on Form 4 filing analysis is this: You want to zero in on insider trades that represent a significant bet by the insider on the future direction of the stock being traded. Anything else is irrelevant noise to an investor. In particular, large or unusually aggressive open market purchases by the most informed insiders (like C-level executives) are the trades to pay attention to. Disclaimer: Do not construe anything written in this post or this blog in its entirety as a recommendation, research, or an offer to buy or sell any securities. Everything in this blog is meant for educational and informational purposes only. Do your own research before investing and don’t risk more than you can afford to lose. This article expresses my own opinions, and I am not receiving compensation for it (other than from WhaleWisdom). I do not have a business relationship with any company whose stock is mentioned in this article. I or my associates may hold positions in the stocks discussed. Michael Burry liked Tailored Brands at $13. A TLRD insider just bought at $7.41. The stock is down 91% since August. But Maiden Holdings insiders just bought at $0.78.